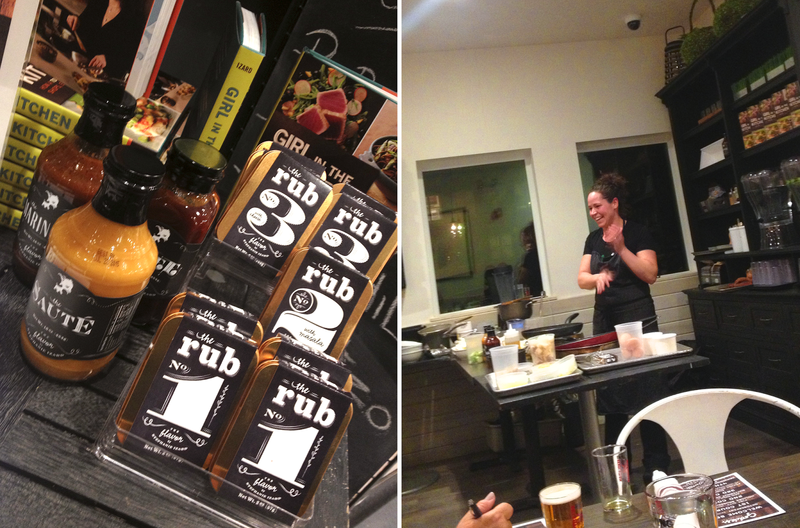 Chef Stephanie Izard demos recipes featuring her product line, "The Flavor." Throughout the course of the evening, we enjoyed Chef Izard’s dishes which were each thoughtfully paired with a Revolution beer. 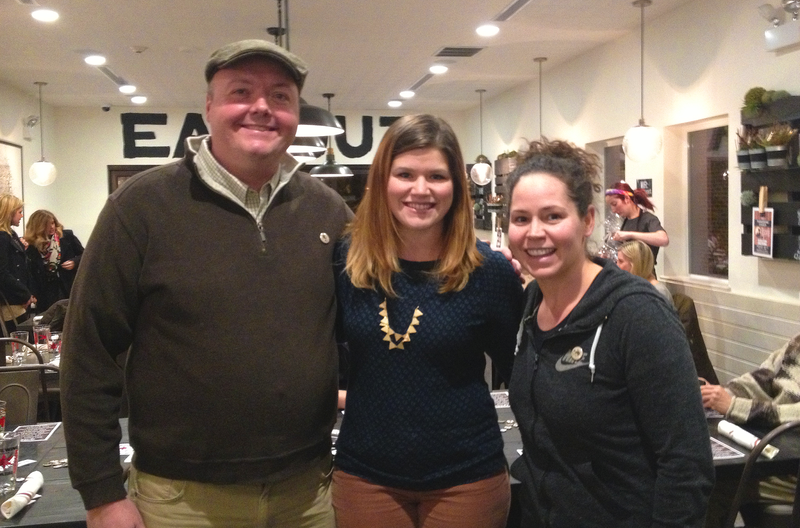 Stephanie only pressed pause to sip these delicious (and generous) three ounce pours, and to turn the floor over to Revolution Head Brewer, Jim Cibak, for some off-the-cuff beer schooling. Cibak explained the impetus behind each paired beer, and aptly reminded us all that brewing and cooking share a common key ingredient: balance. We were each greeted with a pour of Revolution’s Oktoberfest, a well-balanced, bready beauty made from malt sourced entirely from Germany. Über-authentic and easy-drinking, this was a perfect gateway into the rich abundance of flavors we were about to experience. After Cibak enumerated the aromatic qualities of this hoppy american pale ale – powerfully floral and citrusy in aroma, a creamy head of white foam, clear as a bell and golden orange in color with a citrusy hop bite – Stephanie regaled us (all while preparing the Brussels sprouts) with her own personal experience surrounding the uses of commercial hop pellets: “Don’t ever throw a hop pellet into your mouth.” The crowd roared. Our Brussels sprouts arrived charred, quartered, and gleaming in butter, piled on the plate with purple radicchio leaves and crunchy Marcona almonds. “The Saute’s” fish flavors really came through as a fatty, quenching, umami sensation, which contrasted delightfully with the Fist City APA. Its citrusy floral elements were highlighted beautifully by the saltiness of the dish, and even some spicy herbal notes came forward to compliment the subtle, building heat from The Saute sauce. Next came butternut squash “quick kimchee.” Stephanie used The Chee sauce to speedily impart a fermented soybean flavor to paper-thin squash shavings. Half-moon slices of fennel bulb and basil chiffonade completed this richly flavorful dish, which was expertly paired with an equally rich beer. A ruby red color, Red Skull’s sweet aroma contrasted perfectly with the spicy, pickled scent coming off the bright orange plate of salty squash. The sweet malt of the boozy beer stood up strongly next to the powerful kimchee flavors, tasting similarly spicy and herbal in comparison. My favorite pairing of the night came third. Nothing could have prepared my taste buds for the utter salivation and joy they experienced when Izard plopped the tray of just-prepared spiced apple and sausage stuffing with peking-style roasted turkey, smothered in croissant turkey gravy onto the table I serendipitously chose as mine. Yes, it was as good as it sounds. Yes, I gobbled more than I should have. No, I did not care – it was #goddessthanksgiving, dammit. This particularly decadent dish was paired with Revolution’s Eugene Porter, a dark black beer with garnet highlights, this opaque brew was smooth and barely bitter with hints of coffee and caramel and a slightly fruity, roasted chocolate finish. When paired with the dish, the beer’s fruity sweetness was really brought to the forefront, its roasted malt finish effortlessly melding with the flavors of the roasted meat and the sliced apples. Absolutely delightful… and I’m drooling just thinking about it. Chef Stephanie left us with a scoop of sweet vanilla gelato topped with warmed pecan pieces smothered in browned butter, sugar, and cream. The decadent dessert was paired with Gravedigger Billy, a 10.4% ABV Scotch ale aged in Old Forrester Woodford Reserve barrels for 6 months. This boozy, sweet, strong beer was a caramel brown hue that tasted like a maraschino cherry dipped in bourbon. This beer, quite literally, was the liquid cherry on top of a mound of gooey pecan goodness, its candied flavors in perfect harmony with the sweet, creamy treat. Stephanie Izard truly put on a cooking clinic, giving us all a delicious taste of what it’s like to observe someone in their element, doing what they’re meant to do on this planet earth. Goddess and Grocer was the most gracious hostess, and the Revolution beers were the icing on the cake (or the topping on the not-pie). Cheers to all, and thanks for a night my taste buds and tummy won’t soon forget.